When Melbourne Theatre Company Associate Director Dean Bryant assembled his dream cast for Born Yesterday, he didn’t realise he was reuniting a cherished character relationship that had parted ways nearly ten years earlier. 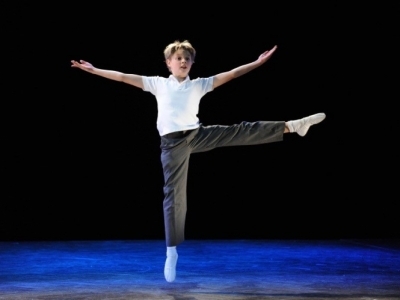 Josh Gates was 12 years old when he left Tasmania and headed for Sydney’s Capitol Theatre to play the title role in Billy Elliot the Musical. He began rehearsing two months into the Australian run, and spun onto stage four months later as the most revered character for any stage-bound boy his age. The fickle finger of performing arts fate (and adolescence) meant Josh was replacing one of the original Australian cast members, whose voice started to break two months into his run. Josh continued playing Billy at Melbourne’s Her Majesty’s Theatre, where he cemented his passion for the city as Australia’s theatre and arts hub. Richard Piper, an MTC veteran currently celebrating his 30th year with the company, played the role of Josh’s father on stage, clocking nearly 500 shows alongside nine different Billys. Josh Gates playing Billy Elliot. Photo by James Morgan. Josh describes his time playing Billy as a crash course for a 12-year-old in acting, and in being truthful. For a soon-to-be teenager, who was desperate to be on stage, Billy was the ultimate role. Richard’s role as Billy’s father also came at an important time in his career and life. It was a chance for the English-born actor to reconnect with his homeland; a place he passionately loved, but politically loathed. 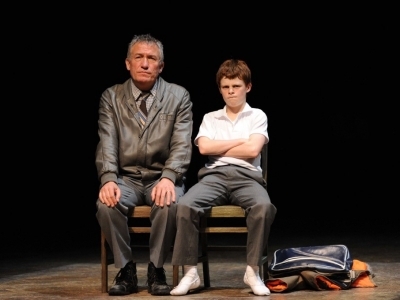 Richard Piper playing Billy’s Dad alongside Josh Denier as Billy. Photo by James Morgan. Josh recalls the final moments of his closing performance, right down to the surge of emotion that welled inside him during the final scene. The Australian production of Billy Elliot went on to collect seven Helpmann Awards, which set a new record at the time. ‘It’s still one of the greatest musicals of all time. In the modern cannon, it’s the show people still talk about,’ says Richard. Nearly a decade after the final curtain call of Billy Elliot, Richard saw his young cast mate on stage again, this time in Opera Australia’s production of My Fair Lady, directed by Julie Andrews. It’s a full circle situation for these friends. Despite their several decade age-gap, both performers have similar dispositions. They both share a passion for the stage and Melbourne’s endlessly evolving theatre community. Working together on Born Yesterday has given Josh the chance to show Richard all the tips and tricks he has taken with him into adulthood as a performer. ‘It’s the same as always, nothing’s changed. Dicky’s really cheeky, and I really like that. It makes rehearsals so much fun,’ Josh says. Scanning over a sheet of Richard’s theatre credits (the list covers three A4 pages), Josh is overwhelmed with the possibilities of his career. Josh Gates and Richard Piper in Born Yesterday with Russell Dykstra and Heidi Arena. See Josh Gates and Richard Piper star in the Broadway classic Born Yesterday, playing until 25 February at Southbank Theatre.